I thought Google Map Buddy's ability to generate printable, hi-res versions of Google Maps was pretty neat but figured I'd never find a reason to use it. These Google Maps envelops, however, are definitely worth the ink and the effort. There's not a whole lot to them, but some of the best ideas are the simplest. 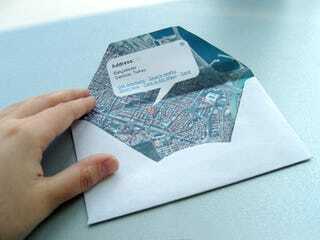 Beste Miray Dogan, a graphic designer from Istanbul, showed that with a Google Map print out and a little ingenuity, you can make a custom envelop that pinpoints the exact location from which it was sent. How nice.